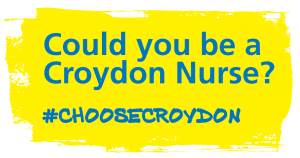 #ChooseCroydon » Could you be a Croydon Nurse? Working at Croydon Health Services is fulfilling and challenging. You’ll meet some of the most engaging and stimulating people in the health profession, who will push you to develop your skills, learn something new and reward you in equal measure. Make an impact, accelerate your learning and rise to the daily challenge of caring for a diverse community – Choose Croydon. I’m pursuing all the opportunities that nursing is bringing me here at Croydon Health Services. It’s a truly worthwhile career and a great place to work. Rose has been a key member of our successful Crocus home birth team and has now moved into a role at in our Birth Suite at Croydon University Hospital. Charlotte works in the community in our school nursing team. She supports schools, young people and their families with a variety of health issues in this rewarding role. Shanee has forged a successful career as a Croydon Nurse. She has explored A&E, looked after patients with heart conditions and has now found a welcome home in the Trust’s Coronary Care Unit. I knew I wanted to work in Croydon early in my nurse training. During my placements everyone was so supportive and I received lots of encouragement. It’s a great team to be part of.